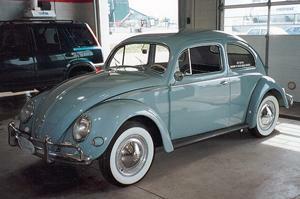 This beautifully restored 1957 Beetle is completely rust free, finished in a glossy light blue with many chrome details. This classic 2-door hardtop has only 65,808 original miles on it and is in excellent condition. Everything from the chrome front and back bumpers to the side running boards shines brightly on this little bug. 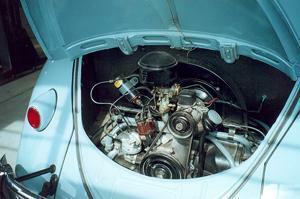 The heart of this beetle is powered by the original rear seated 4 cylinder engine with a 4-speed transmission, all in excellent condition. 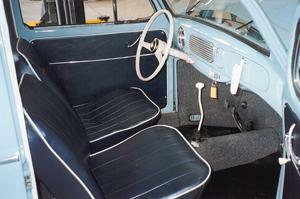 The interior is in excellent condition including blue vinyl upholstery, original dash, headliner, floor carpet, rubber floor mats, floor mounted shifter, and interior moldings. 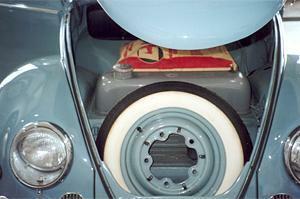 The vehicle is equipped with painted steel wheels, bright metal hubcaps and trim rings. 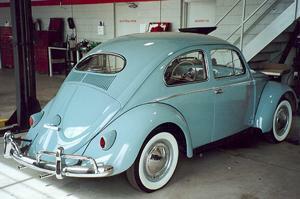 The wheels are fitted with 4 new Commander 4ply Polyester white wall tires to complete this classic beetle. Please contact us at 1-866-413-0679 or 1-705-328-3673 for more information on this or any of our unique, collectable Polito Stable vehicles.